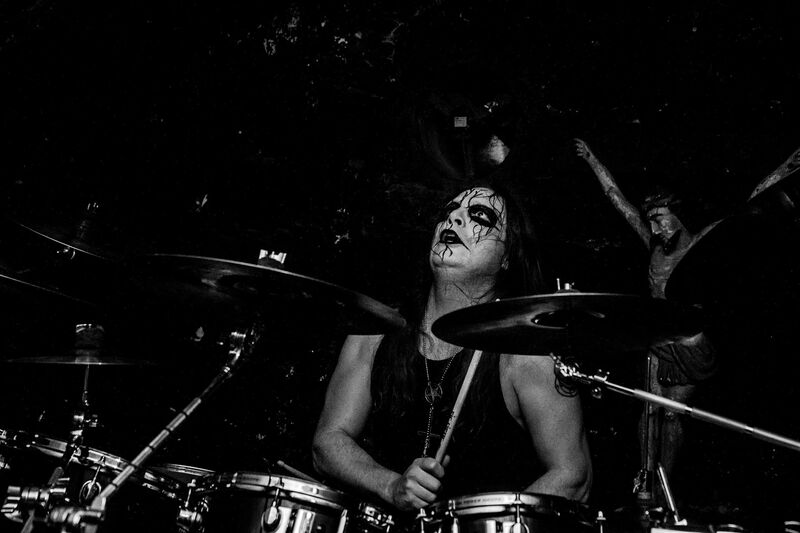 Dagon of American black metal veterans Inquisition opens up in a personal, reflective and philosophical conversation. He reminisces an upbringing amongst the narco terror of eighties Colombia, and shares his thoughts on humanity’s past and future. 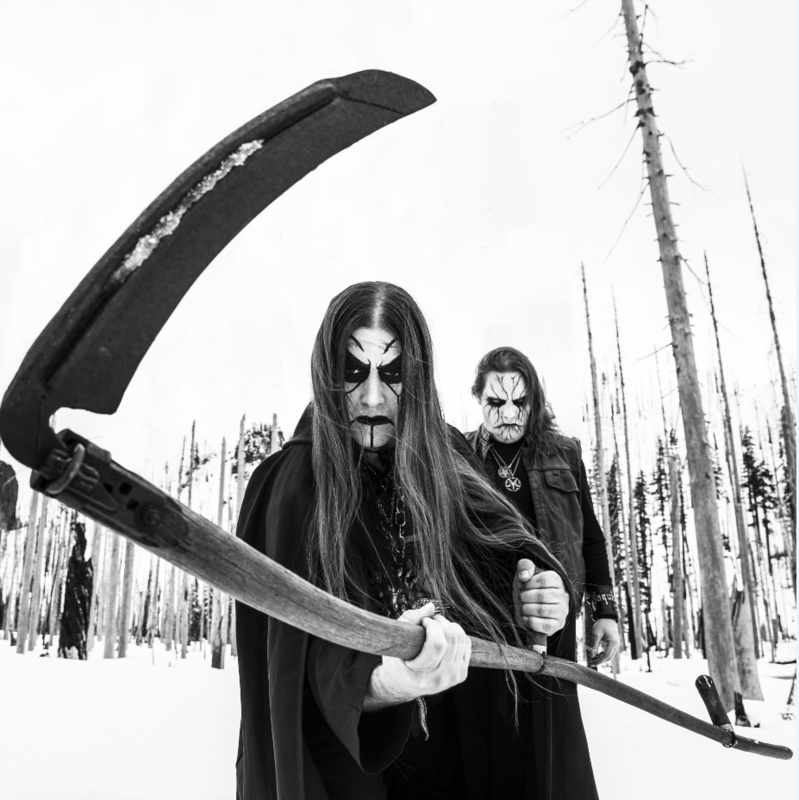 – Our stated goal for this album was to reinforce INQUISITION as a classic black metal band under the same standards and unwritten rules as the old guard. Its intent is to guide the listener into an atmosphere of depth, darkness, majesty, and beauty – all in one, while paying tribute to anything within the context of the occult. While the unknown is a crucial thematic ingredient, there’s also a place for the rational and scientific. Dagon regards these elements as a means of inspiring the listener towards something greater and wiser. – Musically, the old school was also about minimalism, which is something I tried to preserve on this album. We also sought to capture a bit more feeling compared to previous INQUISITION albums. More dynamics, greater contrast between songs. Another fine tradition of theirs is upheld by the essay-length album title; “Bloodshed Across the Empyrean Altar Beyond the Celestial Zenith”. – Though not immediately obvious in our visual theme, the essence of Satanism is as present on this album as ones of yesteryear. INQUISITION explores the origins of mankind, the forces which brought us here. We hail this energy through our music on “Bloodshed Across the Empyrean Altar …”. Dagon says that regardless if one believes in nothing, none can deny the grandeur of our inner space. – The mind has no matter, thoughts have no matter, yet they can accomplish so much more than one’s body. The majesty of our outer space – the universe’s matter – is equally astonishing. Our album is a tribute to human thought and the workings of this cosmos as one incredible being. It also raises the question of what created this. We delve infinitely deeper into this particular rabbit hole later in the conversation. – We’re in a unique area of the genre’s evolution, where we must continue our traditional path but at the same time maintain relevancy by intensifying every element that helped make INQUISITION into what it is. It’s indeed interesting to note how INQUISITION have more or less stuck to the same formula for seven albums now – modified and slightly evolved, yes, but it rests on much of the same foundation. – When people say that we sound the same on every album, it’s as if this wasn’t our exact intent but rather an inability to seek further evolution. I want to preserve and improve our identity but never evolve it in the larger, so obvious sense. Change or evolution comes in the very small details – the latest album is proof of this. I’d have to agree; especially the melodies but also structure and song arrangements bring me right back to the 1998 debut album, “Into the Infernal Regions of the Ancient Cult”. – This might be going to comparative extremes, but Bach sounded like Bach from his first day to his last. Same with many other masters; they preserved and refined the formula they’d established, maintaining it without too much progressive intent of drastic changes. If anything, the subtle alterations were in the technique, making their music increasingly difficult or minimalist. The composers’ unique sound remained the same during their entire lifespan. Their growth and evolution lay in intricate details, Dagon explains, rather than the music’s attitude or atmosphere. – Music is also like mathematics in some regards, where a one will always be a one, a two will always be a two but the placement has almost infinite variations. In the end, everything is still numbers and fractions. The evolution of math is there, but its building blocks remain unchanged. So we’re not going to see an adaption to modern forms? – We’ll not be venturing into extreme chromatic passages, place as many notes as possible into a bar, change to atonal music… no. Today’s generation can evolve that style, we have our own sound which we’ll keep honing. INQUISITION comes from a particular generation and we represent a small part of it. Music can be a time capsule, and sounding dated is not a bad thing. Dagon’s mother relocated him from the United States to Colombia when he was eleven years old. Admittedly, most of my knowledge about Colombia of that era stems from the Narcos television series, but I imagine it must have been quite the change of scenery. – It was a huge cultural shift, like night and day. Narcos isn’t too far off from what was going on down there – just keep in mind that when it came to the narco terror, though heavily affecting outsiders it was mostly within the cartels and guerrilla forces major issues happened. Immediately following his involuntary 1983 relocation to the city of Cali, Dagon began missing all the things he’d previously taken for granted. – Of course, this was the very purpose of being there; to teach me as a young kid what to value in life – to shape my identity. In the end, I think it was excellent parenting. Most of what defines me today, character-wise, is the direct result of a less overprotective first-world upbringing. Dagon mentions having grown up quickly. He might have matured late, but developed an early sense of telling right from wrong – threat from non-threat – and sincere people versus those with deceitful intent. – I don’t want to over-dramatize and make it sound like I emerged from down-town Baghdad, but I definitely grew up where learning street smarts was essential knowledge and highly practical for establishing yourself in a somewhat more aggressive society than say, the Stockholm or Seattle of the 1980s. Further lessons came from keeping company with those on the less wealthy side of the social pyramid. – My friends were real people born into difficult and challenging situations. I knew a few guys who came from the better-off families who were incredible individuals, but ninety-five percent of my social circle came from working class backgrounds and lived in rough neighbourhoods. Dagon would frequently visit and hang out in these areas, which left him exposed to dangerous situations at a rather tender age. – I enjoyed this environment, its people and situations. It was an exciting dynamic where I learned the most about metal music in the years to come. Like punk at the time, metal was about risk and danger – living that essence in the flesh. Luckily, he was in a place of the world where peril lurked in many places, so this could be lived out to a high degree. – Especially when the cartel wars between Medellin and Cali began. By 1989, they were planting explosives in night clubs and supermarkets and setting off car bombs in heavily transited areas. You never knew if you’d end up in the wrong place at the wrong time. As a teenage metalhead, that’s precisely what one tended to do. Besides the risk of being blown to smithereens – much like their brethren in surrounding countries, Colombian metalheads were persecuted by the police. – I was arrested and beaten on a few occasions, one time my mother had to come get me out of jail. I was fourteen at the time and had bruises all over from the beating, simply because a cop hated my long hair. That same night I also witnessed police dragging in a few transsexual prostitutes and beating them until they were spitting blood. One cop would hold a garden hose, spraying cold water while the other beat the victim with a board. Through his adolescent empirical studies, Dagon quickly came to three pivotal epiphanies which have remained with him to this day; the law is not to be trusted; Satan is real; and VENOM, BATHORY and SLAYER are the greatest things of all time. – I saw a few drive-by shootings between 1985 and 1990, when the Cali cartel was cleaning house. If you witnessed something like that, you’d better look the other way and move on. If a hit-man caught you staring too much, you could also be taken out. Usually, the shooter would be riding behind as passenger on a motorcycle. – The second guy would actually get off the bike and walk up to the target … who might have been sitting four or five tables away from you at the local ice cream parlour at say, sixth avenue north in Cali. There you go, from enjoying a banana split to suddenly seeing this guy’s brains blown out of his head… this was a real situation I witnessed in ‘89. Cartel wars were brutal, and things only got worse when the Revolutionary Armed Forces of Colombia, FARC – a communist guerrilla – got involved. – I liked hiking in the Farallones mountain-chain near Cali, but once the guerrilla forces moved in you had to be careful. One time, I woke up with FARC graffiti painted on my tent and we were immediately out of there that morning. Once again, my youth was interesting and I wouldn’t have had it any other way. More so than cartel wars, it was primarily street crime which had him on high alert. – Junkies with knives demanding your wallet or shoes or whatever else might be valuable for resale to fuel their drug addiction. Or the guy with a gun pointing it at your taxi driver at a red light, telling you to get out of the cab so they can steal it while jacked up on speed and anxious to pull the trigger. He suggests that experiencing all of this at a young age makes for a strong character, and teaches you a lot about psychology. – I had to talk myself out of a few situations where a weapon was pointed at me, and looking different was an even greater deal-breaker. One time, a guy put his knife away and asked me about my heritage and what a kid like me was doing in such a bad neighbourhood. Dagon managed to befriend the would-be assailant, got his money back and was recommended to stay out of the area. – I learned a great deal about street smarts in those twenty minutes. According to this guy, criminals go after people who show fear or who act real tough. He told me keep my head up, look friendly but not stupid. I was sixteen at the time. At some point you obviously found underground metal – how does this happen in eighties Colombia? – The rich kids with uncles in London or a dad in New York got all the vinyl and tapes. They were the importers and kept their music under lock and key, so to speak. But they’d record albums for a friend, and from there they leaked. For example, my BATHORY “The Return…” tape would’ve been a fifth or even seventh generation recording. Dagon was lucky in that regard; his best friend at the time, now a prominent Colombian promoter, got to record almost everything he had straight off the vinyl. – He’d call me up in the morning so I’d get on my bike and head over to dub off his tape before school. We were constantly talking about new bands. During break periods, we’d have our Walkman and listen to all the obscure bands of the day. We felt as if we’d found something extremely special. I remember us listening to MERCYFUL FATE and I didn’t want that break to ever end. To him though, the real underground was the local scene – bands with no hopes of ever being signed to any label, wielding the worst instrumentation imaginable. – Drum skins made of x-ray prints and in general everything in the most primitive form – yet somehow managed to do a show somewhere in the roughest parts of town. Their demos were extremely hard to come by, more so because I was in Cali and the bands from Medellin. My black metal of the eighties was PARABELLUM and REENCARNACIÓN primarily. BATHORY and VENOM were the other two. Is INQUISITION still an underground band? – Not by some people’s standards. We receive full exposure, so you can say we broke through the wall that divides mainstream and cult metal. The title ‘underground’ is strictly applied in essence now, as representing an attitude and not just a distribution limitation. This is important, because the attitude is something, perhaps the only thing, that can maintain black metal for what it once was – music of the Satanist spirit. 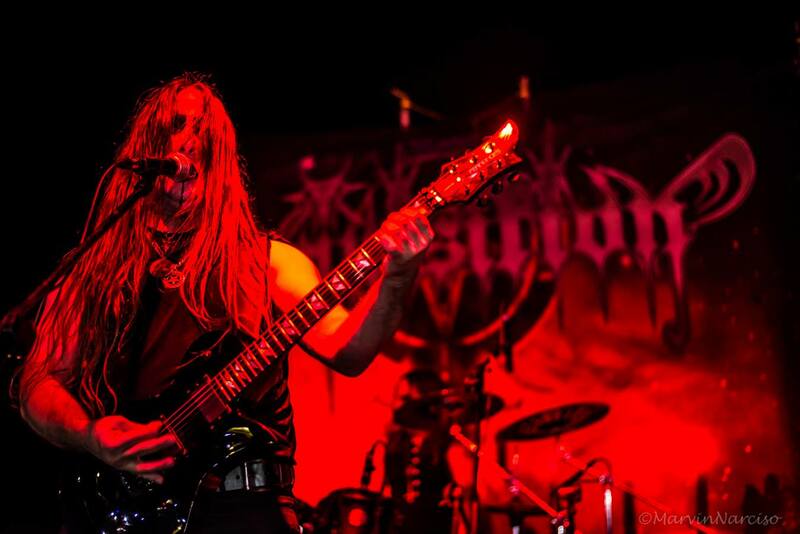 Dagon’s vocals are one of the more striking aspects of INQUISITION. I can’t immediately think of any other metal vocalist who sounds even remotely similar, instead I’m reminded more of the Tibetan style of throat chanting – PHURPA being a grand example. – I think it’s a very good comparison. The irony here is how I didn’t discover throat singing myself until 2007 when we played Moscow, and a Russian fan asked if that’s what gave me the idea. I didn’t know what he was talking about so I looked it up when I got home. He notes drily how people usually compare him to either Abbath of IMMORTAL or Atilla Csihar from TORMENTOR and MAYHEM. – But they never compare those two to each other. I never tried to sound like them at all, and at the most I was inspired a bit by Atilla. Rob Darken (GRAVELAND) is the one who made me think that not screaming was effective for a more obscure approach to black metal. I wanted my voice to be less human; more robotic, dark and dead.